Cut the rounded tip off the hot dogs, then cut into thirds. Carefully slide uncooked spaghetti noodles through the ends of the hot dogs so that equal amounts of spaghetti remain on either side. Each hot dog piece should fit about 6-8 strands. Place spaghetti dogs in a large pot of gently boiling water. Cook on a low simmer for 10-15 minutes. Remove from water and slice each hot dog piece in half. Check to make sure pasta within the hot dog is fully cooked. If necessary, place in pot for a few more minutes. Serve hot with ketchup or tomato sauce. Hi Rebecca, I worried about the same thing too, but found that the turkey dogs did just fine, especially if cooked at a low simmer (not a rolling boil). What I did test was the length at which I cut them. I found that it took much longer for the pasta to cook within the dog if the pieces were too long, so I cut them into 1.5"-2" lengths, cooked them for about 10 min., then cut those pieces again in half (roughly 3/4-inch). 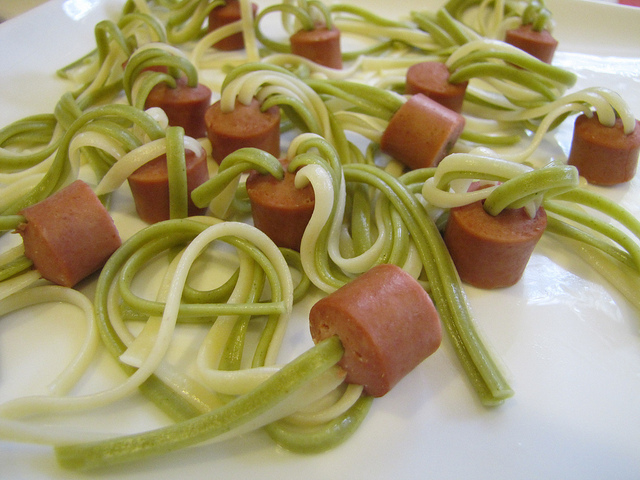 These spaghetti-stuffed hot dogs are perfect for Halloween or any time you want to make a fun kids' meal! We like to use colored spaghetti, like spinach or tomato, to add color. Tasty tossed in a tomato sauce or simply with ketchup on the side.